This article was written by Rosie Woods, published on 4th August 2014 and has been read 2578 times. Rosie Woods came to Ibiza as a British Council language assistant after graduating from Aberystwyth University with a degree in French and Spanish. 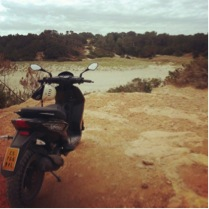 This was her second year abroad and second experience as a language assistant in Spain. Although I’d never been there myself, like the rest of the world I was aware of Ibiza as a holiday and clubbing destination, a paradise for British and German tourists, and during my first week on the island (in September) I found exactly that! However, as winter draws in things become quieter, the clubs and beach bars close for the winter and almost all flights back to the UK stop. Which might sound a little depressing, but in my opinion “off season” is the best time to experience the true magic of Ibiza and get to know the other face of the island. Although the buses can be infrequent during the winter, one of the benefits of living on such a small island is that you never have too far to commute. Unless you have a car I would highly recommend you live in either Eivissa (Ibiza Town) or San Antonio, which are the 2 main towns on the island with the best bus connections. Although still quiet compared to the craziness of summer, Eivissa remains fairly lively all year round, so I’d recommend living here if you’re concerned about your social life. There is a language exchange group called ALBA Ibiza who organise weekly meet ups. It’s also a good idea to look at the Ibiza Spotlight events calendar as there are often cool things going on. Although this did not happen as much as I expected, as with any touristy part of the world there is always the danger of falling into the dreaded “English trap” and not practicing any Spanish. My advice is to persevere with speaking Spanish even if you are replied to in English. Remember, just because somebody has detected your British accent it doesn’t automatically mean you are rubbish at Spanish and if you politely explain you want to practice folk will nearly always oblige. Another thing to be aware of is the fact the Ibicenco language (a dialect of Catalan) is also spoken on the island as well as Castilian Spanish. Although Catalan is the island’s official language and the language spoken in schools, I found it was much more common to hear castillano on the street, perhaps because of the international nature of the island and the people from elsewhere in Spain, Latin America and all over the world who have chosen to make Ibiza their home. Having previously lived on the peninsular during my university year abroad, I found living in Ibiza to be a much more “international” as opposed to “Spanish” experience, simply because so many people visit the island as tourists or season workers and love it so much they just have to stay! Ibiza is truly the world in one small island and I love that about the place. In my role as a language assistant I talk to my teenage students about British culture, and in turn they will tell me not only about Spanish and Balearic culture but also about the traditions of the countries their families come from; of Germany, Holland, Thailand, Argentina and many more. What amazes me is that while the children are all very proud of their heritage, even those who were not born here identify as Ibicencos and wholeheartedly embrace local traditions. At local fiestas, people of all ages gather to celebrate, and several of my students delighted in teaching me how to dance the Ball Pagés (or the traditional dance of Ibiza in which the women take teeny tiny baby steps while the men dance and kick around them trying to win their attention.) The multicultural atmosphere means you don’t feel like a foreign outsider but are welcomed to take part in island life. 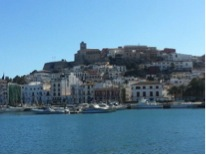 Dalt vila (Ibiza’s old town) is a UNESCO world heritage site and a beautiful area to walk around. Every Saturday there’s a flea market selling anything and everything - definitely worth a visit if you like a bargain! Another weekly market, this one is a little more expensive but definitely worth visiting even if it’s just to look at all the pretty things! Often towns and villages on the island will hold fiestas to commemorate their patron saint. 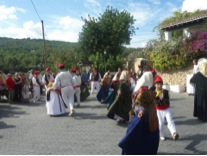 Here you can find local crafts and see villagers perform the Ball Pagés, the traditional dance of the island (a list of fiestas can be found here). There are several 'fiestas de flower power', which celebrate the island’s hippy influence and are just a great excuse to wear flowers in your hair, John Lennon style glasses and whatever else you fancy! 6. Get out and explore! One of my favourite things about Ibiza are the beautiful areas of countryside to hike and explore and secret beaches to discover. 60 of San Antonio’s bars participate in this event where you can try gorgeous pinchos and tapas at special prices. There’s even a little train that takes you from bar to bar! 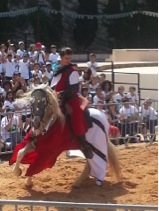 Every year Dalt Vila (the old part of Ibiza town) is taken back to the middle ages, with musicians, market stalls, and events like jousting. Casita Verde is a centre for sustainable living. They run tours every Sunday and also serve yummy vegetarian food! Ok, technically this isn’t Ibiza but the beautiful island of Formentera is just a short boat trip away and definitely worth a visit!